In the Daley Plaza courtyard, a series of tents portray what life is like for the millions of people around the globe being forced to flee their homes due to war, natural disasters, and other forms of conflict or persecution. In one tent, two cots are set up next to containers of medicine and syringes in a makeshift hospital; in another, toys made with local materials are scattered on the floor in a barebones tent, representing a home for a family living in a Somali refugee camp. 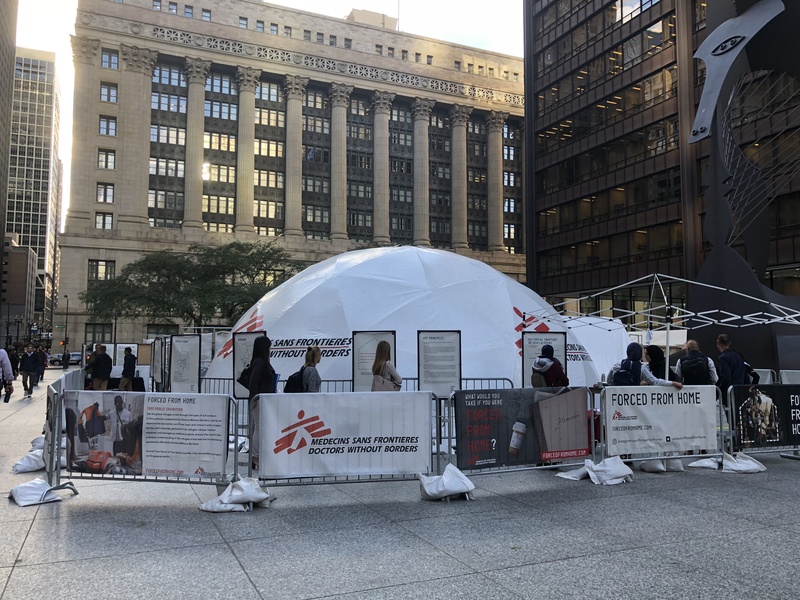 The tents are a part of “Forced from Home,” an interactive educational exhibit presented by Doctors Without Borders on display in Chicago until Sunday. Doctors Without Borders is a humanitarian aid group also known by its French name Médecins Sans Frontières or MSF. According to MSF and the UN Refugee Agency (UNHCR), there are 68.5 million refugees and displaced persons around the world — record numbers higher than any time since WWII. More than half of these people are children. The MSF exhibit focuses on causes of displacement, as well as the perilous journey refugees and asylum seekers must often undertake when seeking safety. Upon entering, guests are given an identification card from a country affected by the crisis; the card also indicates legal status as an internally displaced person, asylum seeker, refugee, stateless person, or migrant. They are then guided around by an MSF field worker who discusses global displacement, with a particular focus on five countries: Syria, Afghanistan, South Sudan, Burundi, and Honduras. Realistic tents and displays provide a glimpse into the dire conditions refugees often face: 360-degree videos screened in a small dome tell intimate stories from inside refugee camps; visitors are later asked to cram inside a rubber boat like those many board to cross the Mediterranean; and displays of refugee camp setups show the various conditions families encounter after crossing borders. Several public health issues facing displaced persons are also discussed, from malnutrition to vaccine-preventable diseases. “Forced from Home” runs through Sunday in Chicago and then travels to Charlotte, Atlanta, and San Antonio. More information and content from the event can be found on its website. In the coming weeks, Sheila Burt will be writing in more detail about the exhibit and feature interviews with MSF aid workers. Sheila Burt is a science writer at the Shirley Ryan AbilityLab in Chicago. She received her bachelor’s degree in journalism from Northwestern University and a master’s in science writing from The Johns Hopkins University.